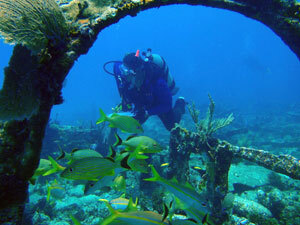 Within Florida Keys National Marine Sanctuary lies a trail of historic shipwrecks, scattered along the coral reefs and buried in the sandy shallows a few miles off shore. The nine ships along this Shipwreck Trail have many tales to tell, from the stories of individuals who came before us to why they were here and their difficulties in navigating these waters. Visitors are encouraged to explore the sites along the trail. An underwater guide is available for each site on the Shipwreck Trail, providing the shipwreck and mooring buoy positions, history, a site map, and information about marine life divers might encounter. Conditions on the Shipwreck Trail sites vary from easy dives in shallow water to deeper dives of l00 feet or more where swift currents may be encountered. Some of the deeper sites require mooring to submerged buoys. Please help protect the sites on the Shipwreck Trail, and all the sanctuary’s maritime heritage resources, so that they may be enjoyed by future generations. When diving, remember to control your buoyancy, since shipwreck structures can be as fragile as the marine life they support. Disturbance and removal of artifacts is prohibited. It’s best to leave these pieces of history where they are, for other divers to enjoy and for historians to document.